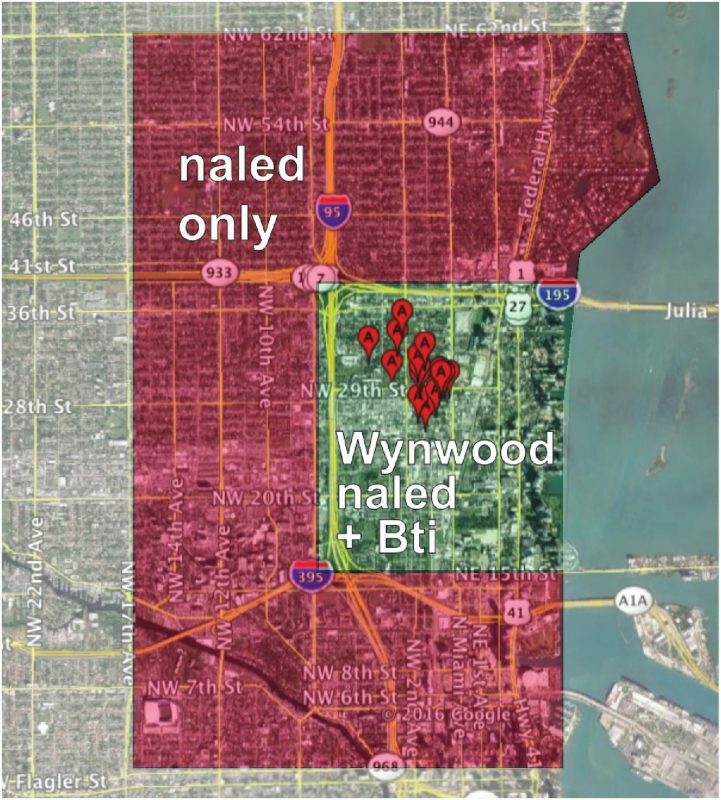 East-central Miami showing the 5 km2 Wynwood area where both naled and the larvicide Bti were applied. Red markers indicate locations where mosquito traps were placed in that area. Bacterial larvicide, not standard insecticides, are the best solution for mosquito control, according to new research by FIU biologist Philip Stoddard. When it comes to the Aedes aegypti mosquito, which is responsible for Zika transmission, controlling populations at the larval stage is particularly effective. Overall, larvicides are more effective and a safer long-term solution as opposed to insecticides that target adult populations, Stoddard said. Miami Beach neighborhoods of South Beach where Zika appeared first and Mid-Beach into which Zika expanded. Red markers indicate trap locations. Results from the recent study show larvicides were responsible for steady declines in the Aedes aegypti populations, with some populations dropping as much as 90 percent. In those cases, naturally occurring bacteria found in soil was used that only targets mosquito larvae. The study actually analyzed three methods of mosquito control deployed in the summer of 2016 when the first case of locally transmitted Zika was reported in South Florida. Miami-Dade County Mosquito Control used a mix of insecticides targeting adults and larvicides to combat the mosquitoes. Population data was determined based on mosquito counts from traps placed in the Zika zones of Wynwood and Miami Beach. Results showed insecticides targeting adult mosquitoes had no significant effect on population counts in Miami Beach. Naled, a potent and controversial insecticide, was among the adulticides used to combat the Zika-spreading mosquitoes. Derived from a class of chemicals developed as nerve agents during WWII, naled has raised concerns about its potential harm to non-targets including people and pollinating insects. After three days of spraying in Wynwood, the Aedes aegypti populations were virtually identical to pre-spray levels, according to Stoddard. Average counts were actually 7 percent higher after those first three days. Stoddard says fundamental changes need to occur in how communities manage mosquito control. These findings were published this month in Acta Tropica.